Kyo-Ya Hotels & Resorts is considering plans to install three T-shaped rock groins and widen the beach fronting the Sheraton Waikiki as part of a larger upgrade to its properties. The company's proposal involves three T-head groins spaced evenly apart along a 500-foot span of shoreline, extending out 160 feet from an existing seawall. The cost is estimated at $3 million to $4 million. The nearest surf site, Populars, should not be affected, Kyo-Ya's consultant says. Although still preliminary -- such a project would require approvals from the state as well U.S. Army Corps of Engineers -- the plans already have opposition. George Downing of Save Our Surf says he is dead set against the proposal, which he says is ill-advised and ineffective. He vows to fight it. George Downing, 77, knows Waikiki from one end of the beach to the other, having spent several decades as a beach boy and having surfed every break in his lifetime. He feels he knows what's best for the famous beach. Now he's taking a stand against a proposal by Kyo-Ya Hotels & Resorts to install T-shaped rock groins along the beach fronting the Sheraton Waikiki. Although still preliminary -- it would require approvals from the state as well as U.S. Army Corps of Engineers -- Kyo-Ya has commissioned Sea Engineering Inc. to work on the proposal. As part of its previously announced $750 million upgrade for its Waikiki hotels, Kyo-Ya is looking at spending $3 million to $4 million to replenish the beach fronting its properties. 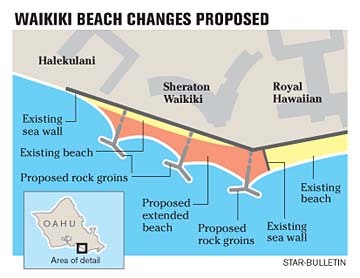 The proposed Gray's Beach restoration project in Waikiki, as written up by Sea Engineering, would construct three T-head groins spanning 500 feet of shoreline, extending 160 feet from the existing seawall. Sand taken from offshore would be placed between the groins, adding more beach in front of both the Sheraton Waikiki and the Halekulani Hotel. But Downing, one of the founders of Save Our Surf, is dead set against the T-head groins. T-groins were attempted at Kuhio Beach back in the 1950s -- they didn't work then, he said, and won't likely work again. T-head groins have been used in beach restoration projects in Florida, the Gulf Coast and the Caribbean. But Downing says Hawaii's reef and waves are different, shaped by volcanoes, with deeper water close to shore. He fears that this project is only the start of a series of T-groins along Waikiki Beach. "Man has destroyed Waikiki," he said. "Don't destroy it any further." Construction of the three T-heads would cover a portion of the reef platform, though only a small fraction, where there are no unique marine flora or fauna, according to the Sea Engineering report. However, algae on which the green sea turtles feed might be affected, it says. Populars, a surf site off of the beach, would be about 600 feet from the proposed groin heads and would not be impacted, according to the report. Kyo-Ya filed a draft environmental assessment in August regarding its master plan improvements for the Sheraton Waikiki and Royal Hawaiian Hotel, which includes widening of an existing concrete walkway in front of the Sheraton Waikiki. But no mention was made of the Gray's Beach restoration project. Kyo-Ya executive Vice President Ernest Nishizaki did not respond specifically to questions about the project's status. "Kyo-Ya has been a part of the community in Hawaii for almost 40 years, and we share the community's belief that the preservation of our precious natural environment is a vital concern," he said in a written statement. "As a result, we have been talking with government agencies as well as ocean recreational users, community groups and environmental and cultural organizations about restoring the area formerly known as Gray's Beach. We recognize the input of all stakeholders is essential and we will continue to explore with them the possibility of restoring Gray's Beach." Chip Fletcher, a professor and chair of the geology and geophysics department at the University of Hawaii, said he supports the T-groin proposal. "The Waikiki shoreline is not a natural shoreline any more," said Fletcher. "We have engineered it into its present configuration. But if we're going to maintain it as a usable resource, we need to employ engineering tools." The T-groins can work if done correctly, he said. He sees it as a way to protect the surf sites. Scott Werny, head of the Surfrider Foundation's Oahu chapter, said it has no position on the project at this time. In 2000, the Board of Land and Natural Resources considered a $2 million Kuhio Beach project that would have removed the existing "crib" wall and installed T-shaped groins to create four gently curving beaches. That project, also opposed by Save Our Surf, fell short of funding, and the crib wall remained. "We've never lost a fight yet," swears Downing.